A peculiar class of meteorites has offered scientists new clues about when the planet Jupiter took shape and wandered through the solar system. Scientists have theorized for years now that Jupiter probably was not always in its current orbit, which is about five astronomical units from the sun (Earth's distance from the sun is one astronomical unit). One line of evidence suggesting a Jovian migration deals with the size of Mars. Mars is much smaller than planetary accretion models predict. One explanation for that is that Jupiter once orbited much closer to the sun than it does now. During that time, it would have swept up much of the material needed to create supersized Mars. But while most scientists agree that giant planets migrate, the timing of Jupiter's formation and migration has been a mystery. That's where the meteorites come in. Meteorites known as CB chondrites were formed as objects in the early solar system—most likely in the present-day asteroid belt—slammed into each other with incredible speed. This new study, published in the journal Science Advances, used computer simulations to show that Jupiter’s immense gravity would have provided the right conditions for these hypervelocity impacts to occur. That in turn suggests that Jupiter was near its current size and sitting somewhere near the asteroid belt when the CB chondrules were formed, which was about 5 million years after formation of the first solar system solids. "We show that Jupiter would have stirred up the asteroid belt enough to produce the high-impact velocities necessary to form these CB chondrites," said Brandon Johnson, a planetary scientist at Brown University who led the research. "These meteorites represent the first time the solar system felt the awesome power of Jupiter." Chondrites are a class of meteorites made up of chondrules, tiny spheres of previously molten material, and are among the most common meteorites found on Earth. The CB chondrites are a relatively rare subtype that have long fascinated meteoriticists. Part of what makes the CB chondrites so interesting is that their chondrules all date back to a very narrow window of time in the early solar system. "The chondrules in other meteorites give us a range of different ages," Johnson said. "But those in the CB chondrites all date back to this brief period 5 million years after the first solar system solids." But to Johnson, who studies impact dynamics, there is something else interesting about CB chondrites: They contain metallic grains that appear to have been condensed directly from vaporized iron. "Vaporizing iron requires really high-velocity impacts," Johnson said. "You need to have an impact speed of around 20 kilometers per second to even begin to vaporize iron, but traditional computer models of the early solar system only produce impact speeds of around 12 kilometers per second at the time when the CB chondrites were formed." So Johnson worked with Kevin Walsh of the Southwest Research Institute in Boulder to generate new computer models of the chondrule-forming period—models that include the presence of Jupiter near the present day position of the asteroid belt. Big planets generate lots of gravity, which can slingshot nearby objects at high speeds. NASA often takes advantage of this dynamic, swinging spacecraft around planets to generate velocity. 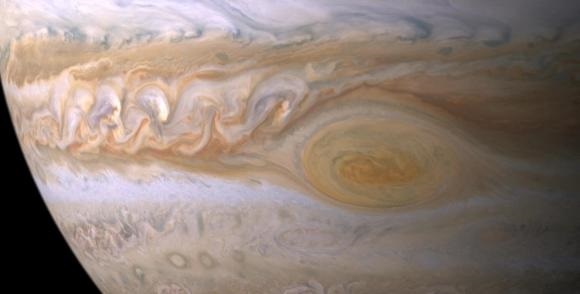 Walsh and Johnson included in their simulations a scenario of Jupiter's formation and migration considered likely by many planetary scientists. The scenario, known as the Grand Tack (a term taken from sailing), suggests that Jupiter formed somewhere in the outer solar system. But as it accreted its thick atmosphere, it changed the distribution of mass in the gassy solar nebula surrounding it. That change in mass density caused the planet to migrate, moving inward toward the sun to about where the asteroid belt is today. Later, the formation of Saturn created a gravitational tug that pulled both planets back out to where they are today. "When we include the Grand Tack in our model at the time the CB chondrites formed, we get a huge spike in impact velocities in the asteroid belt," Walsh said. "The speeds generated in our models are easily fast enough to explain the vaporized iron in CB chondrites." The most extreme collision in the model was an object with a 90-kilometer diameter slamming into a 300-kilometer body at a speed of around 33 kilometers per second. Such a collision would have vaporized 30 to 60 percent of the larger body's iron core, providing ample material for CB chondrites. The models also show that the increase in impact velocities would have been short-lived, lasting only about 500,000 years or so (a blink of an eye on the cosmic timescale). That short timescale allowed the researchers to conclude that Jupiter formed and migrated at roughly the same time the CB chondrites formed. The researchers say that while the study is strong evidence for the Grand Tack migration scenario, it doesn't necessarily preclude other migration scenarios. "It's possible that Jupiter formed closer to the sun and then migrated outward, rather than the in then out migration of the Grand Tack," Johnson said. Whatever the scenario, the study provides strong constraints on the timing of Jupiter's presence in the inner solar system. "In retrospect, it seems obvious that you would need something like Jupiter to stir the asteroid belt up this much," Johnson said. "We just needed to create these models and calculate the impact speeds to connect the dots." Other co-authors on the paper were David Minton (Purdue University), Alexander Krot (University of Hawai'i, Mānoa) and Harold Levison (Southwest Research Institute). Funding was provided by NASA's Solar System Exploration Virtual Institute (NNA14AB03A). Computer simulations were run on the National Science Foundation's XSEDE computer cluster.